Region: This Caterpillar is found throughout North America. Life cycle: This insect produces one generation each year and hibernates as a mature larva. 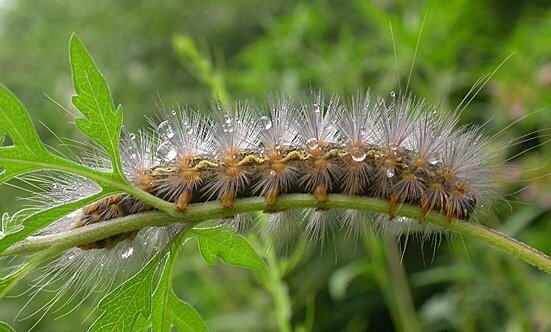 Physical Description: This 2-inch long caterpillar is gray to rusty brown with a black head. The adult moth is nearly pure white, or an orange/yellow and white with black marks. The wingspan of this moth is up to 2 1/2 inches. The eggs are laid in masses of thousands on the underside of leaves. Feeding characteristics: This pest attacks vegetables and fruits, such as, the apple asparagus, bean, beet, cabbage, carrot, celery, corn, lettuce, onion, and plum plants. The caterpillar will feed in large groups on the underside of leaves, quite often defoliating a whole tree or ruining entire fields of crops. Controls: If the number of infested plants is small, hand pick the insects and destroy it and the heavily infested parts of the plants. If the problem is serious or the damage is intolerable, then apply Bacillus thuringiensis as a dust or spray. Tachinid flies are parasitic predators of this caterpillar and can aid in keeping the numbers down.